Murata Manufacturing Co., Ltd. will begin selling a Passive Starter Kit which supports the reference design of Smart Bond ICs DA14682 and DA14683 for Dialog Semiconductor this February. The kit, EKSM-PDADA1A-KIT, uses a Dialog chip to support Bluetooth 5, and it offers all of the needed passive components for carrying out a design. 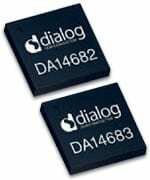 According to Dialog, the SmartBond DA14682 and DA14683 chips are said to be the first single-chip solutions for smart home, industrial, and wearable devices that meet the high-security standards. The integrated System-on-Chip (SoC) devices, which the Passive Starter Kit uses, support Bluetooth 5 as well as Bluetooth mesh, and they include a range of dedicated features to ensure cutting-edge security for both consumers and developers. Murata says that because all of the passive components are available at the same time, the designer mostly freed from the inconvenience of procuring components for making samples. This kit is produced based on reference designs that Dialog issued and confirmed. It is meant to be used by designers of IoT applications including accessories for smartphones, home automation, various kinds of sensor devices, and remote controllers. Murata also includes various compact products to enable them to be used for compact applications including wearable devices, as proposals from Murata Manufacturing Co., Ltd. The company noted that from now on as well, it plans to develop the product lineups, as support tools for designers working in the IoT market which includes Bluetooth®.